The inclusion of the Master in the celebratory nature of Doctor Who’s twentieth season with its cavalcade of familiar faces was an inevitability following the iconic foe’s recent resurgence during the transition from the Fourth Doctor to the Fifth. Unfortunately, even though ‘The King’s Demons’ was not intended to be the de facto season finale before the anniversary special ‘The Five Doctors’ aired later in the year, it nonetheless marks one of the weaker stories of the Davison era so far. As was the case with the preceding year’s final story ‘Time-Flight,’ itself a less than inspiring story, the Master here seems to be included simply because he is a familiar face rather than because the script has anything new or novel to do with him. It’s fair to say that the character peaked in ‘The Keeper of Trakken,’ but he has since become a generic villain whose motivations are questionable at best. As it is, he is the most instantly recognisable foe of this anniversary season, but structuring the two-part story so that his reveal is the cliffhanger of the first is inherently flawed and really only gives a brief glimpse of the true villain himself. Much like ‘Black Orchid,’ the placement of the cliffhanger means that the second episode is by necessity very rushed as it tries to deal with the ramifications of the Master’s appearance after a lighter first half. The Master here is trying to prevent the signing of the Magna Carta, but it certainly doesn’t help matters that the Doctor and his companions question his intent and call it small-time villainy by his standards, and the Master never addresses what he truly hopes to accomplish by doing so. However, the Master’s plan does involve the introduction of Kamelion, a truly wonderful idea that was obviously doomed from the start. As a piece of machinery, Kamelion is suitably impressive in its appearance and strangely otherworldy in its movements, especially as it speaks, but it’s painfully apparent even from its limited appearances that it is hardly the most mobile creation. Of course, the difficulty of controlling the robot is a well-documented story in and of itself, and it’s hard to believe that the production staff ever truly thought the machine could be incorporated in any meaningful way on a recurring basis. However, the notion of the robot that can take on the appearance of someone from a person’s thoughts is fantastic and, in theory, opens up a wealth of potential storylines going forward. It’s quite refreshing to see such contrast between Tegan and Turlough, the determined defiance of the former and the cowardice of the latter presenting an intriguing divergence of reactions that speak to different shades of human nature quite well. 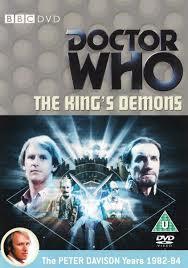 Unfortunately, ‘The King’s Demons’ has trouble with its characterization of the Doctor himself, particularly following the exceedingly strong portrayal in ‘Enlightenment.’ Through no fault of Peter Davison himself who does incredible work with what he is given, ‘The King’s Demons’ is a rather small-stakes story that for some reason still writes the Doctor as a rather passive character who simply pleads for what he wants. It’s clear that the Doctor is incredibly upset about what is occurring, and he does take action when needed, but writing the character as having such trouble in this lighter story hardly bodes well for when the stakes are more substantially raised. There are some good moments and ideas to be found within ‘The King’s Demons,’ but the end result is an uneven one that suffers from its structuring and uninspired use of the Master and the Doctor, a weak finale to a bumpy season that succeeded more when it looked less to the past.